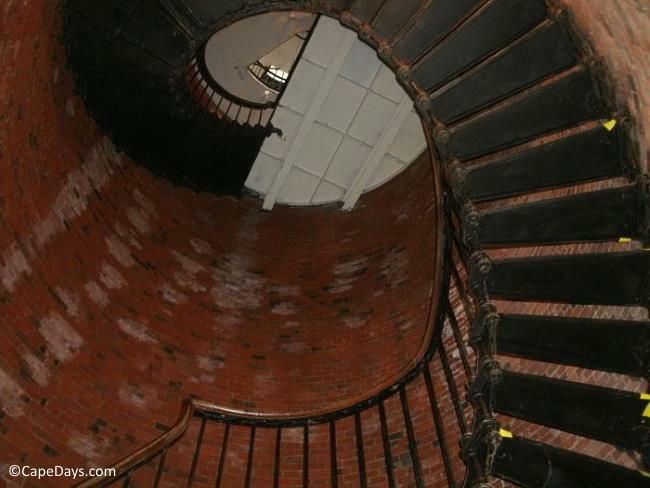 Five historic Cape Cod lighthouses are open to the public for tours during the summer months and on special occasions in the off-season. Click a link to go straight to that section. A few local lighthouse organizations won't be publishing their 2019 tour schedule until late March or April. If you see a "TBA" (to be announced) notation below, please bookmark this page or save it to Pinterest so you can easily check back here for updates! Nobska Light sits high on a bluff in the Falmouth village of Woods Hole. Originally built in 1828, Nobska Point Lightouse's original Fresnel lens is still in use. The nearby island of Martha's Vineyard is visible in the distance. 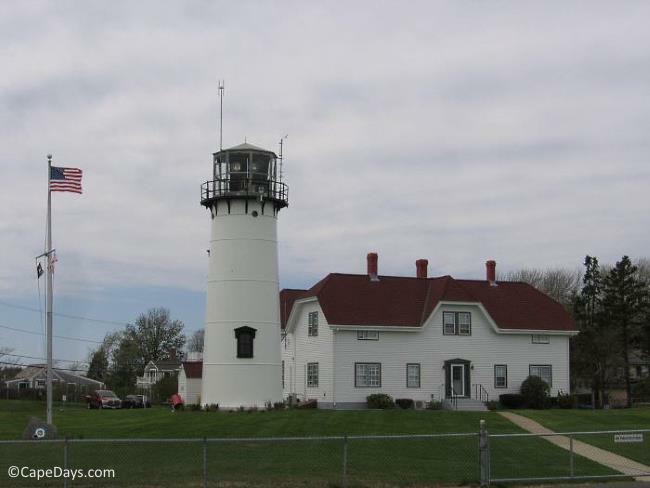 The organization Friends of Nobska Light has recently undertaken the daunting task of preserving and protecting this wonderful lighthouse, the keeper's house and the grounds. Donations toward this worthy cause are gratefully accepted! The grounds are open for visits daily, year round. Admission: Free. Donations are appreciated! Route 28 in Falmouth, to Woods Hole Road, to Church Street, to Nobska Point Lighthouse. If you're biking along the Shining Sea Bikeway in Falmouth, you can also reach the light house by turning off the Bikeway at Church Street, or turning off at Oyster Pond Road then onto Nobska Road. For more than two centuries, mariners have relied on beacons from Chatham to safely navigate the treacherous waters around the "elbow" of Cape Cod. Chatham Light, as you see it today, is one of two lighthouse towers that stood here in the mid-1800s. 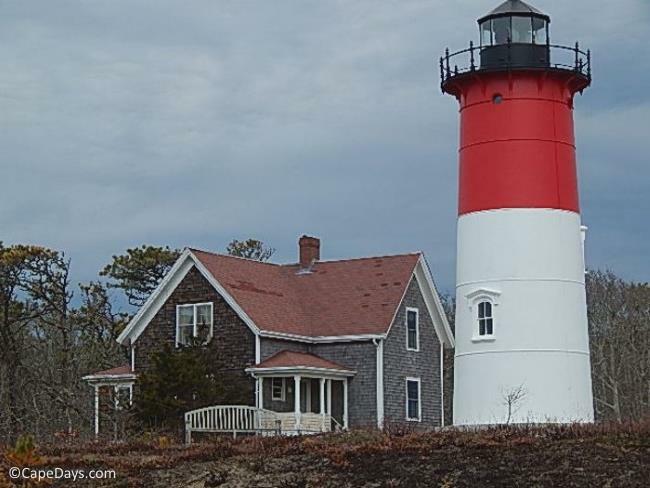 In 1923, the second tower was dismantled and transported up the coast to Eastham, where it became "Nauset Lighthouse" (see below). Chatham Lighthouse is perhaps the most often-photographed of all Cape Cod lighthouses, and one of the most popular for visitors thanks to its beautiful setting overlooking Lighthouse Beach, one of the most spectacular beaches in Chatham. Unless otherwise noted, touring hours are from 1:00 to 3:30 p.m.
Take Main Street to Shore Road. Parking near Chatham Lighthouse is extremely limited and often impossible to find. It's best to park in town and walk, bike or take the trolley (seasonal) to the light house. Nauset Lighthouse was moved to Eastham from Chatham in 1923 to replace the last-standing of Eastham's "Three Sisters" - a trio of Cape Cod lighthouses that had, over time, succumbed to the elements and erosion of the cliffs on which they stood. When you visit Nauset Lighthouse, you can see the restored Three Sisters by following a short walking trail from the Nauset Light Beach parking lot. Route 6 to Brackett Road, to Nauset Road, to Cable Road, to Nauset Light Beach Road. Note: You'll find vehicle parking at the adjacent Nauset Light Beach parking lot. Cape Cod National Seashore parking fees apply until 4:30 p.m. 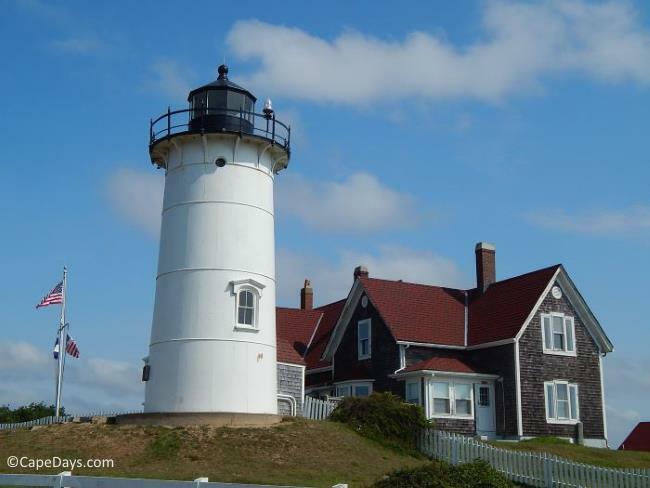 The first light house on Cape Cod was built on the cliffs of North Truro in 1797. Over the centuries, Highland Lighthouse has been re-built, re-fitted and even moved a number of times to save it from toppling off the eroding cliffs into the ocean. The latest move took place during the summer of 1996, in an amazing process that involved sliding the 430-ton structure more than 450 feet along steel beams lubricated with Ivory Soap! 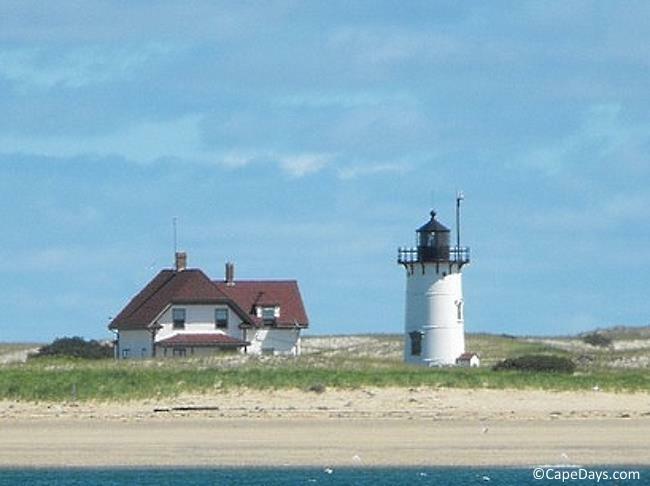 FYI: Although its formal name is "Cape Cod Lighthouse", we all know and refer to it as "Highland Light". Route 6 to Highland Road, then right onto South Highland Road, and left onto Highland Light Road. Race Point is the most remote of all Cape Cod lighthouses accessible by land. Or, if you have a 4-wheel drive vehicle that's equipped to travel over sand, and you buy the required permit, you can drive out to the lighthouse. Find out about oversand driving to Race Point here. ** A special Mariners Day Tour will be held on Sunday, May 19, 2019 from 9 am to 2 pm, rain or shine. On this day only, transportation to the lighthouse will be provided from the Race Point Beach parking lot. Light refreshments will be provided, too. Admission: Suggested donation of $5 per adult (ages 8-60) to climb the tower. Route 6 to Race Point Road, then follow the signs to Race Point Beach parking lot. A parking fee or National Seashore parking pass may be required. The blue icons indicate where each "tour-able" lighthouse is located. To find out how to get there, click on "Map" view and zoom around with the (+ and -) buttons. 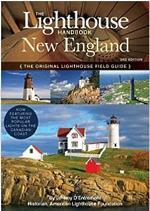 Lighthouse lovers and history buffs, this book's for you! 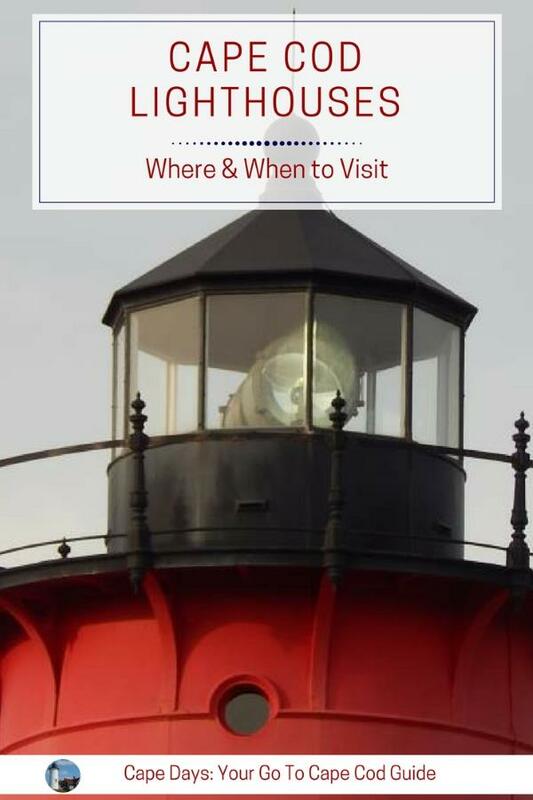 The Lighthouse Handbook - New England is filled with the fascinating stories and vintage photos of our local lighthouses and their "keepers" throughout the centuries. It's a wonderful read! Check it out! For true aficionados, what could be better than vacationing at a lighthouse? Race Point Light - "Getting away from it all" takes on a whole new meaning when you stay here. The renovated keepers house has 3 bedrooms, shared kitchen and bathroom, and very few modern conveniences. Bring your own food, cook it yourself, and have the time of your life swimming, beachcombing, and watching the sun set from the lantern room. Wings Neck Light - Located on Wings Neck Point in the village of Pocasset, this is the perfect spot for a unique family getaway. Swim and sun at the beach. Fish from the rock jetty. Or just lounge the day away on the lawn, watching ships come and go from the nearby Cape Cod Canal. It's all good! The keepers home is available for rent weekly. NOTE: Tour schedules, hours of operation, entrance fees, etc. may change at any time, without prior notice. Please confirm all information on your own before making any travel plans.